So at the prompting of a few folk, its time to document the progress on the refresh that is currently going on with the Blue Cipher. I should warn folk that it'll be updated irregularly in fits and starts as the spare time of Dad and helper no. 1 is limited. I had planned to have this all done by the end of the month - but reality has intervened, and frankly I'll be happy if its done before the end of the summer !! 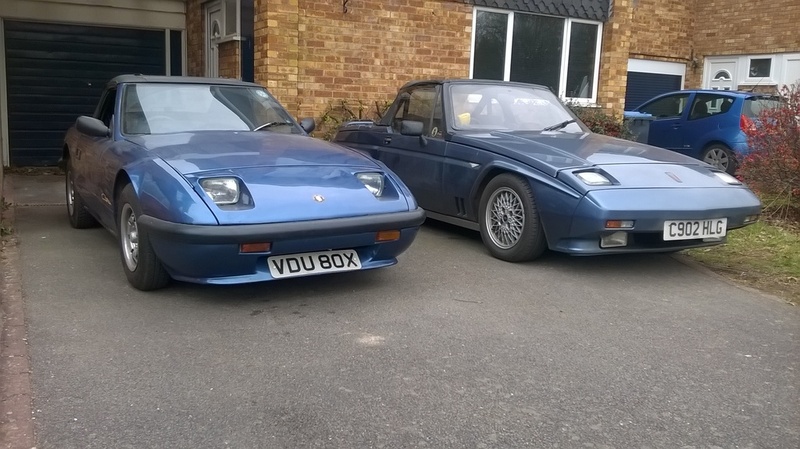 So to start the story - after running around with a little 850 engine putting out over 60BHP for 18 months, driving around NOT being a trailer queen - and even doing the daily commute whilst one of the family cars was down, the ciphers developed a bad cough and it was sent to rest in the garage whilst we worked out the problem. A family illness and death intervened and frankly not much got done... So with things getting back to normality, it was time to haul the Cipher out of storage and to the new house for a lot of mechanical TLC. 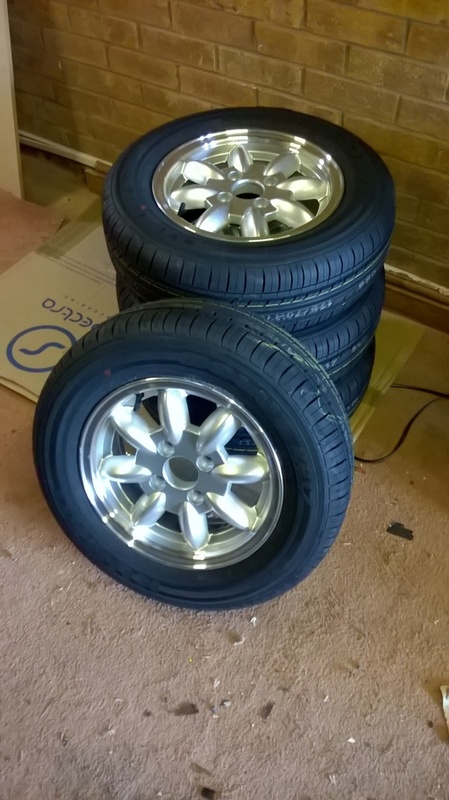 The cipher met its new stable mate for a few days before disappearing into the garage.... Whilst the cipher had been away, a new set of 13" wheels had arrived - to allow for the disk brake upgrade that will go on the cipher (see Dave's Green Cipher Thread for the idea). Now the 13" wheels work fine on the front - just a simply add new wheel studs and a 10mm spacer. But the back axle is a different story - it requires 15mm spacing to clear the rear springs. For the cipher that could mean using 2 spacers together (5+10mm) or get a custom spacer made. 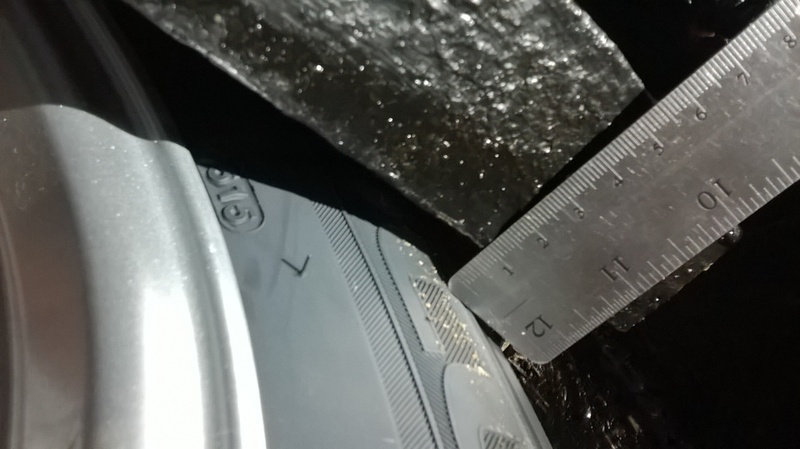 But with the thickness of the alloy wheel that would need wheel studs longer than the 55mm ones used at the front (standard are 35mm) - probably 65mm. This got me thinking there must be a better way to do the whole thing (dangerous thought :roll:) So one thing that could be done is to use a Reliant Fox drum and 10mm Spacers, Fox drums are not only sturdier than the kitten drum, but also have a 5mm spacer built in (see photo below) - so change the studs to 55mm add a 10mm mini wheel spacer and Bing ! your done. But then after thinking about the Fox drum - I realised that if I swapped the kitten van axle (which Ciphers use) for a Fox Axle - as the axle is 3/8ths of a Inch wider in the right directions than the kitten one, I could do away with the spacers all together - a proper engineered solution - and probably one reliant itself would have followed if it had built the cipher. 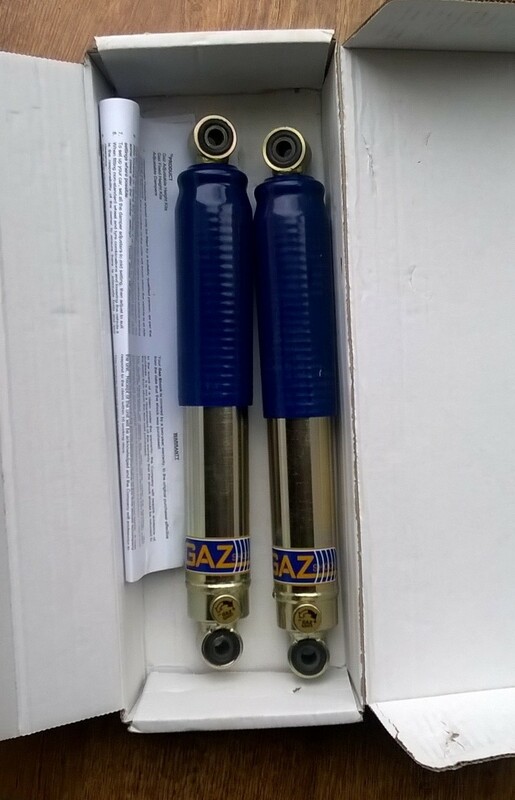 Now Fox axles are rare and not only that, they have a gear ratio of 1:4 (rather than the 1:3.5 Kitten Van) - fortunately I had a Fox axle to hand and with a little help from Keith suitable new internals were fitted to give a gear ratio of 1:3.23 (standard Kitten). Upping the ratio whilst reducing the Ciphers acceleration a little will fortunately make it cruise at motorway speed a lot better, give a higher top speed and all at revs that wont make my ears bleed any more ! 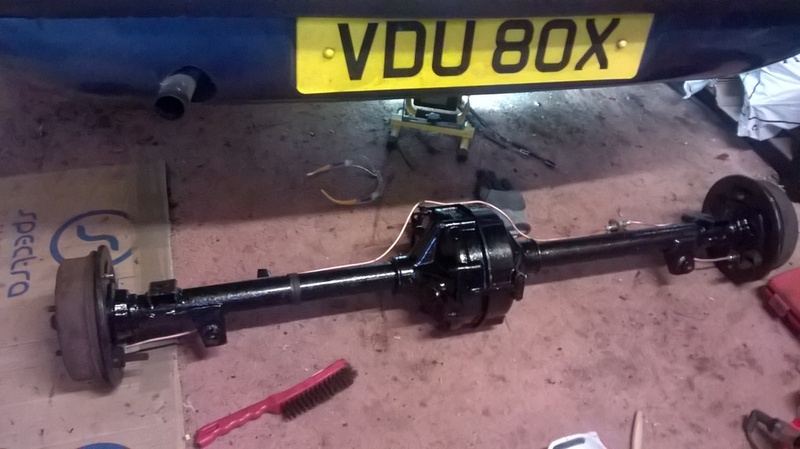 So the old axle was dropped and the nicely cleaned upgraded Fox axle presented to it. and finally add the back wheels - I should add that this thread does make it look very quick - actually this process took over 2 weeks of grabbing a few minutes here and there. 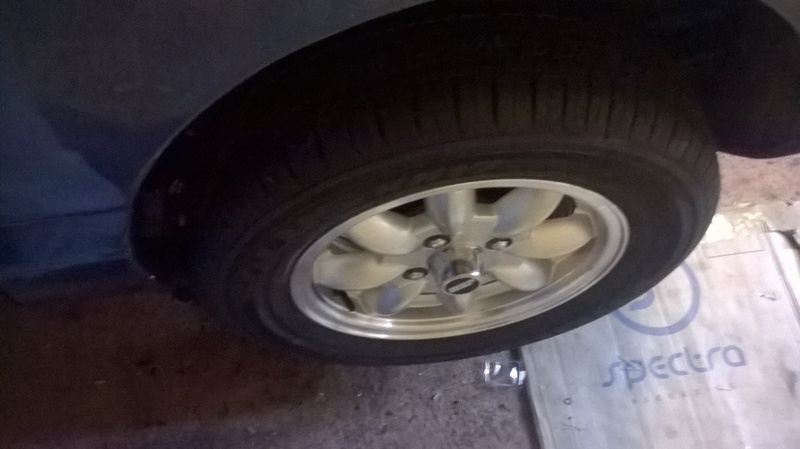 I then checked the back wheels clearance from the springs - which were a healthly 8mm per side - which is what Dave (see Green Cipher thread) has achieved with spacers - so all good and on the money. Additionally the wheels are well within the arches - which is a good thing - I won't bore you all with the carefully prepared vertical photo which just shows the body work and my feet that I took to check it though !! 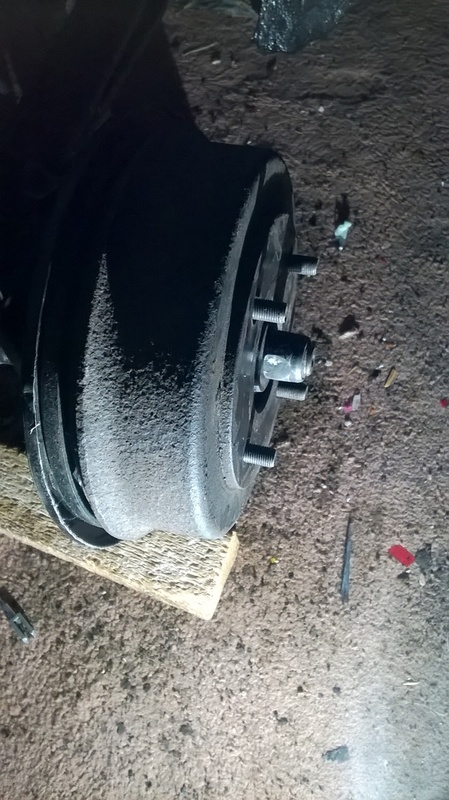 So all done and back on the ground with an upgraded and refurbed rear axle - and no spacers on the back - even with 13" wheels - a big success although it took some time ! Whats next ? - well there is a refurb. prop shaft to match the axle to go on - and of course and engine and gearbox to remove and sort before we can head off for the MOT. One thing this whole process has taught us is how tight our spare time is - and in the whole triangle of power/reliability/time (money not considered here !) to be considered for the future. 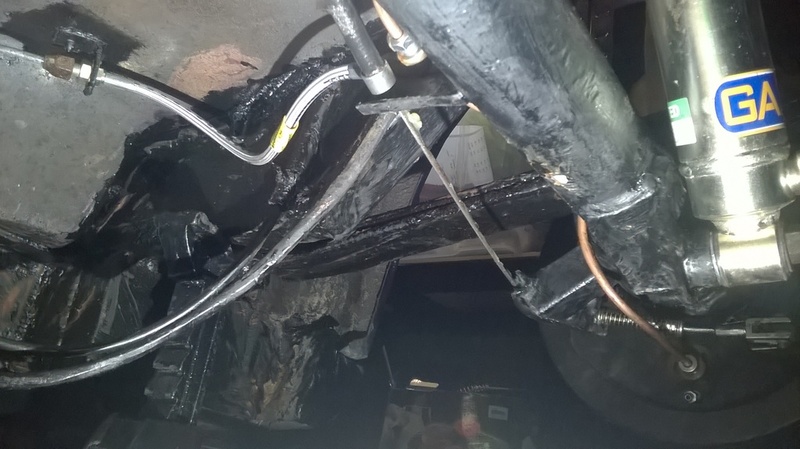 The current 60BHP engine is going to be left out and rebuilt slowly and carefully as time allows - its not going to be rushed just to get it back in for the MOT. So that leaves getting things running again in time for the summer - and probably installing the low mileage yellow top 850 we have around - it won't be big power - but the engine is a very good, study reliable engine with lots and lots of torque - better probably to have in for now with the new higher ratio back axle. Hopefully it should be in the car for a lot longer than 18 Months and should do some serious mileage - If I'm luck it'll be in the car long enough for my eldest to grow up and be old enough to do the swap back to the big power engine on her own !! So that's all for now folks - I'll keep you posted as and when time and progress allow - hopefully the next couple of steps won't take more than a few months ! !